Today's theme is "tribal print." I wanted to make an attempt to be historically and culturally accurate in my manicure, so I started doing some research on Native American tribes. 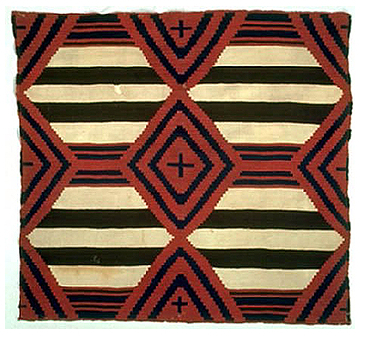 I eventually found an image of a Navajo blanket from the late 1800s that I really liked and that I thought would translate well. I did end up making a few changes to it so that it made more sense as a nail design. This is my final result! This is the photograph of the blanket that I based my manicure off of. As you can see I did make a few changes, mainly to the red diamond areas. For my base color, I used Color Club Mod In Manhattan. 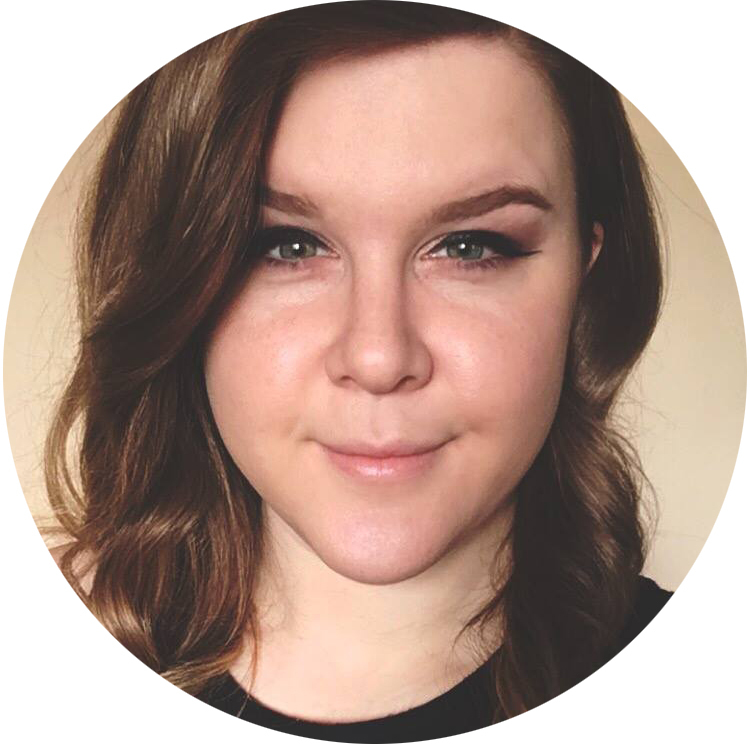 This off white shade is exclusive to a collection sold in the Birchbox Shop, though you could easily replace it with a shade like Zoya Jacqueline or OPI My Vampire is Buff. Then, because I'm a glutton for punishment, I decided to try freehanding the thick black stripes on top. 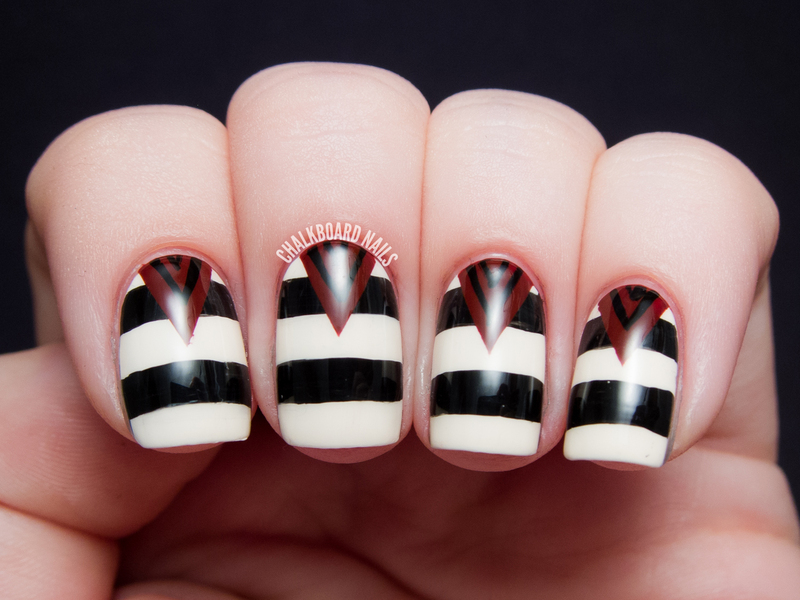 I definitely could have done them as a tape manicure (and it would have been way easier) but I need practice on my horizontal stripes. I used Duri Into the Further as the black here. I used Zoya Pepper as the triangles, and this is one element of the manicure that I did use a tape technique on. The final step was to freehand the black points inside of the space. I don't know about you guys, but I love the bone white combined with the brick red. There's something so "fall" about it, but it still has the bold graphic appeal from the black stripes. My tribal nails from 2012! My tribal nails from 2011! So gorgeous! I love the simplicity of this. 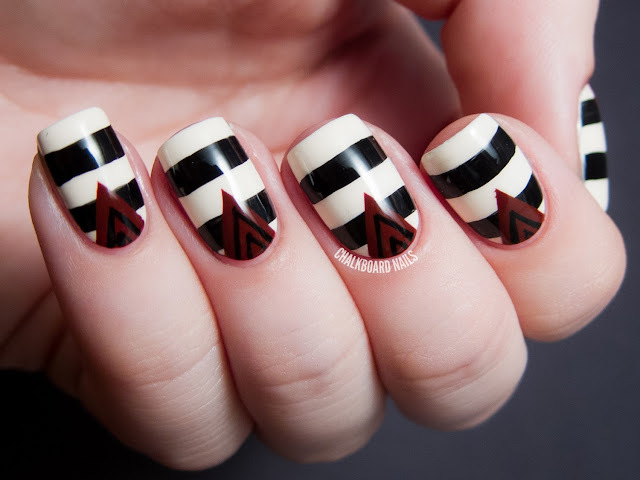 This is a very stunning tribal mani, amazing job! Love it. I love how many of your manicures look so beautiful, but could be something that perhaps I could try. I love this. Its simple, but extremely cool at the same time! I love that you used the blanket as inspiration! So much better (and not culturally offensive) as a lot of the "tribal manis I see!!!!!!! 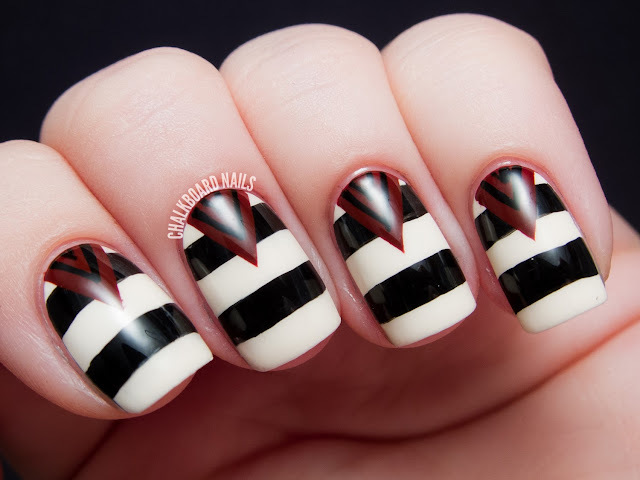 Love love love the combo of the red, black and off white....its gorgeous and the striping looks fab!